There are even a few diagrams to show how the limiting, expanding and gating work as well as the circuit layout/configuration for the plugin. Installation is also kept secure, well explained and straightforward enough much like other Softube's products. The performance of the Softube Valley People Dyna-mite is nothing short of incredible and unique in it's own way. I cannot compare the plugin and the original hardware unit because i haven't used the hardware unit but from what i hear from engineer friends of mine who have used the hardware, it is very very close to the original. The GUI is excellent and even has a short explanation of each setting whenever you change something to guide you through the features sort of, the size of the GUI is perfect and even the look of it is badass. Check out this link to hear top Producer/Mixer/Engineer Joe Chiccarelli speak about the hardware unit and for anyone who has used the plugin, his description of it's effect matches what you will hear when using the plugin. 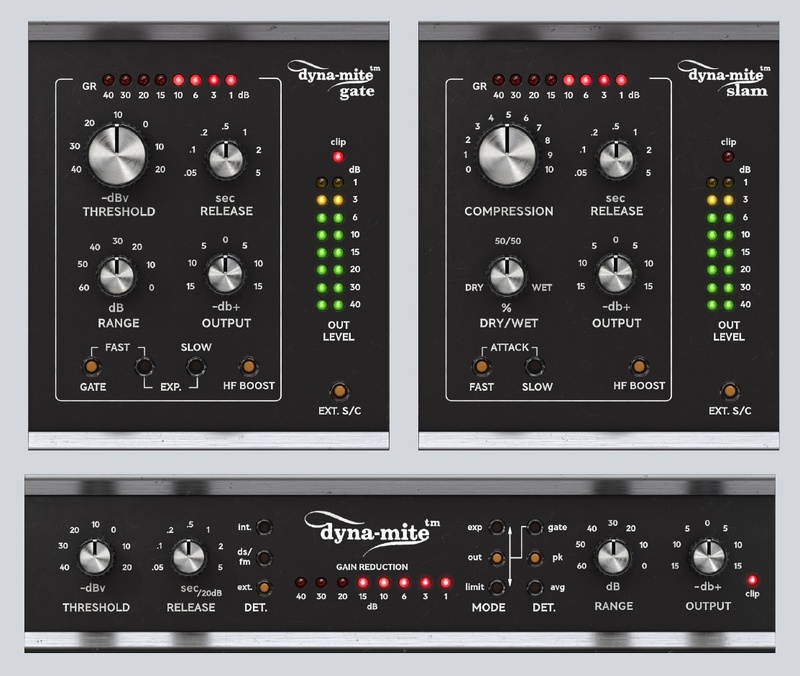 The Dyna-mite is very stable and i have had no issues what so ever since i started using it with Logic Pro 9 on a macbook with OSX 10.6.8 and 4GB of RAM back in October 2013. This plugin is very light on CPU usage and you can confidently use at least 20 instances of the plugin without worrying about performance issues, you probably won't need anywhere near that many but the possibility is always there. The gating is fierce with this plugin, very strict and tight indeed for audio with a lot of bleed, negative thresholds can also be selected to give a 60's reverse Hendrix like feel to a sound for lack of a better description. The sidechaining and keying options can be selected using the 'EXT' option to achieve that ducking, pumping bassline so prominent in dance music or for voiceover work to turn the music down whenever someone is talking. 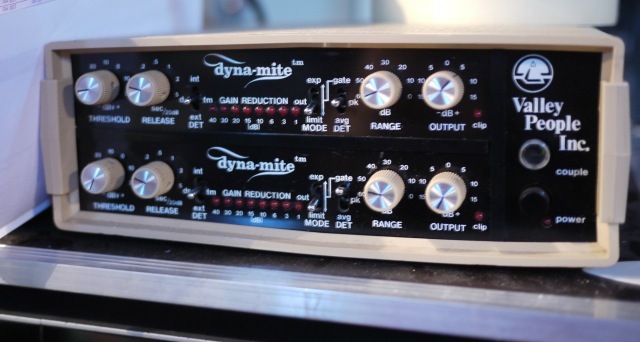 The Dyna-mite is also a useful De-Esser when the ds-fm mode is selected along with limit mode and peak to control sibilance in vocals or harsh hi hats/cymbal transients. With all of these options it is easy to see why the Valley People Dyna-mite has been described as a secret weapon and hidden treasure by Softube, as it is not as famous as an 1176 or Fairchild for example but it is a classic piece of gear nonetheless, with producers and engineers worldwide being able to benefit from it's convenient migration to plugin land thanks to this Softube emulation. If i really had to critique any part of the Softube Valley People Dyna-mite plugin, then i would say it is not the most versatile in terms of compression use due to no 'attack' or 'ratio' settings (ratio is fixed at 20:1 for limiting/compressing), but then again you wouldn't complain about a Ferrari not being good for off road driving or at Arnold Schwarzenegger for not doing romantic comedies. The Valley People Dyna-mite knows what it excels at, and in my opinion that is smashing drums. It's snappier than a pissed off Jack Russell and can add A LOT of bite to snares, kicks, loops and drum buses amongst other things. The avgDET option with limit mode and fast release (0.01 sec) is best for getting the snap from drums and even basslines, guitars and pluck synths if desired as it uses a slower attack time... although in saying 'slower' it is still below 10ms in my estimation so still pretty quick. Using the Dyna-mite on an aux send for Parallel compression can add so much sustain to a drum track you will still be hearing it the next day, for this effect just set it to limit mode, .1 or .2 sec/20db release time (or even longer depending on the material) and pk (peak) detection to clamp down on the transients in order to lengthen the envelope and add some serious power and weight to the drums. The tendency is to overdo things with the Dyna-mite, and i STRONGLY recommend you do it at least once to get it out of your system and just for the fact that it is ridiculously satisfying to destroy a drum track with 60db of pumping gain reduction. The saturation as a result of high gain reduction is another beautiful characteristic of the Dyna-mite and can be useful for blending in a richer texture to the source or for a blown out exaggerated effect. 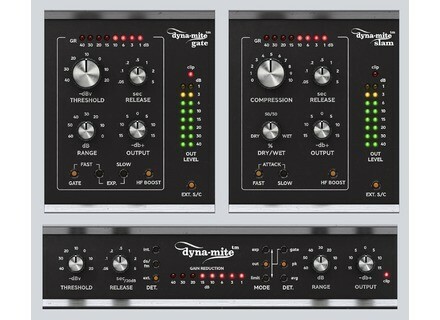 Overall the Softube Valley People Dyna-mite is a very effective plugin and an excellent emulation of the original hardware unit. Yes it does gating, sidechaining and expanding very well indeed, but as a headline grabber this thing can crush the life out of any audio you put in front of it, which depending on the type of music you work on could be useful or not so useful when it comes down to how you approach things. It can be inspiring if you are looking to mess about with audio and create some interesting effects using the limiting, gating, expanding or sidechaining. The only reason i can think of to not get this would be the high price tag of over $200, i think to be fair it could be a bit lower. If it's a one size fits all compressor you are looking for then don't get this, but if punch and snap with a tight gate is what tickles your fancy then you'll be hard pushed to find anything else in-the-box that beats the Softube Valley People Dyna-mite. Softube's Valley People Dyna-mite plug-in is a multi-purpose dynamic processor, acting as an all in one compressor/limiter, gate, and expander. Softube has teamed up with a number of different hardware manufacturers out there including Valley People to put out plug-in versions of popular outboard gear, and the Dyna-mite is one of them. I don't have this plug-in, but I've used it a good amount at the studio that I work at as we have all of the Softube plug-ins. Using the plug-in is fairly straight forward, even if you haven't used the original hardware version. If you've ever used a compressor/limiter before, you'll certainly recognize the parameters at hand here since they're really simple. It's got knobs for threshold, release, range, and output, and is also has side chain options and a mode switch to choose between limit, gate, and an expander mode. It also has a guide at the bottom that shows you in writing your signal flow, which is a really cool feature and isn't something that I really seen anywhere else. I haven't seen the manual for this plug-in so I can't say anything about it other than it probably isn't necessary for most users. The Softube Valley People Dyna-mite is a really complete, flexible, and versatile plug-in. For starters it sounds fantastic and is very easy to use. I like plug-ins that are emulations of analog gear, as they seem to in general have a nice feel and it's especially cool when you've actually used the original as I have with this. I've never had a chance to shoot out the two of them together, but I will say that this plug-in sounds really very good and from what I remember sounds pretty close to the real thing. If you're looking for a plug-in to serve as an all around dynamic processor for mixing, the Softube Valley People Dyna-mite is a great way to go.